Last updated: July 14, 2018 at 10:27pm by Savanah – Casino’s in Iowa increased revenues by $15.7 million in the 2017 fiscal year compared to last year, with total revenues of $1.45 billion. Terry Rich, the CEO of the Iowa State Lottery, is trying to get an online lottery in their state. Iowa lawmakers introduced two bills last year to legalize and regulate daily fantasy sports betting. If a bill passes it would impose a 7.5% tax on revenues generated by the daily fantasy sports companies. Also, Morgan Stanley predicts Iowa will be one of the next six states to pass and regulate state-licensed online poker. Wow, never would have guessed people in the state of Iowa play poker online. The unofficial survey later goes on to say that over half of the people that play poker at home games, land-based casinos, etc., also play poker on the World Wide Web a few times a week or more. Iowa is an interesting state when it comes to poker, and gambling in general for that matter, as an example a person can play poker socially while drinking under a licensed facility as long as they don’t win or lose more than $50 in a 24-hour period. More on this legal form of gambling later in the article. How Would Poker Online be Taxed in Iowa? Several companies, individuals, organizations, etc., have been studying poker on the internet to find close estimated revenues from a national and state level since many in the USA are considering or proposing legislation. There are two main taxing methods being discussed. One is a tax on the Gross Gaming Revenue (GGR), or rake, of the poker site. This is the current tax system in place for brick-and mortar casinos. The second tax method would be a tax on the deposits made by the poker players. This tax rate would be a significantly smaller percentage than the GGR method as it taxes the money when the poker site receives the money rather than take it during the course of play as the rake. A GGR tax model is easier to estimate the total tax revenues for the government, as where taxing the deposits each time of every player can be tougher to predict. Either way a majority of the taxes would stay within the state while a very small percentage would go to the federal government. The IRGC uses a 22 percent tax rate, the maximum allowed, for each of the 15 licensed riverboats/casinos and one of the three licensed racetracks. However, it is believed the taxes for internet poker would be lower since operators don’t have the same types of buildings/facilities to maintain like a land-based casino or poker room does. It appears difficult at times for states to get somewhat clear and accurate information and statistics when it comes to online gambling. Some recent reports show the potential for Iowa to receive up to $13 million per year on taxed revenue from poker on the net while other studies show 2% of people have gambled online over the past 12 months. The 2% includes wagering on sports, playing casino games, poker or bingo on the internet. The Iowa Department of Public Health did a report on a public health prospective in regards to internet poker. About 3% of gamblers admitted having online gambling problems in the last 30 days. Some people showed a concern in the trust, fairness, deposit and withdrawal security when signing up and playing at a website. If a regulated internet poker option becomes available, some Iowans who had not previously gambled on the web in the past would start, at least giving it a try. Card and Parlor Games – Gambling is not legal in a licensed beer or liquor establishment unless the establishment holds a social gambling license. If the establishment holds a social gambling license, it allows patrons of a beer or liquor establishment to play card and parlor games for money. This social gambling license only costs $150 and is good for two-years. Again, participants in this gambling operation must be 21 years or older, and cannot win or lose $50 in a 24-hour period. This is what I was mentioning towards the top of this article how Iowa’s gambling laws are quite interesting. 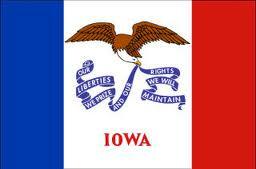 In 1989, Iowa became the first state in the United States to legalize riverboat gaming. Iowa’s initial gaming laws provided for wager and loss limits, but with the success of casinos under less strict rules in nearby areas they eventually adjusted their own policies to provide some more lenience. In 1994, they began allowing its racetracks to install slot machines with table games being introduced in 2005. There is a maximum 22% tax-rate on gross gambling revenue at riverboats and land-based casinos, while there can be a 24% tax-rate at racetracks with slots and table games with revenues exceeding $100 million. Casinos in Iowa collectively pay over $331 million in gaming taxes to the state and over $392 million in state corporate taxes, and have purchased over 87% of their products from business within the state which totals $240 million. The state’s 18 casinos bring in 22 million visitors annually, two-thirds coming from out of state, and have invested over $15 billion into their casinos over the past 20+ years. Iowa’s lottery was legally approved in April of 1985 and began selling lottery tickets four months later; they definitely didn’t waste any time getting started. People can buy pull-tab, instant-scratch and/or lotto games at 2,500+ locations throughout Iowa. Five residents in Iowa are appointed by the governor to create a board for the state lottery which oversees the entire operation. 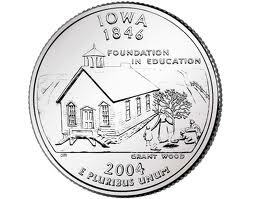 Since the inception of the state lottery the proceeds have gone to various programs since 1985, and Iowa continues to change their mind on where this money should go. Originally, the proceeds were supposed to go to a long-term economic development program but that only lasted six years. In 1991, the profits were to go to environmental and cultural programs, which lasted one year until they went to the state general fund. Eight years later more changes were made with the money going towards veterans, a public health fund, and a vision program but that is changing once again.